Much of the curriculum of Al Azhar—the Islamic world's most prestigious university, located in Cairo—is based on Islamic books written in the medieval era or earlier. These books—histories, biographies of Muhammad, hadith (words and deeds of the latter), tafsirs (Koran exegeses), etc.—are often criticized by more reform-minded Muslims for being too backwards, teaching things such as unrelenting jihad and hatred for non-Muslims. During a recent televised interview, Sheikh Ahmed al-Tayeb, Egypt's highest authority on Islam and Grand Imam of Al Azhar, was asked about his university's reliance on these books. His responses left many reformers disappointed. Tayeb insisted that all books used by Al Azhar are fine: "Our heritage books are innocent and being abused by those ignorant or indecent among us—and that's all they can be: either ignorant or indecent." 'Al Azhar doesn't change religious discourse, [it] proclaims the true religious discourse,' says Tayeb. He continued his apologia: "Some say, do away with the other, ancillary books of Al Azhar. Okay, but then how can I understand the Koran and Sunna?" He explained that if Al Azhar got rid of the other books, every Muslim would be free to interpret the Koran any which way they want—claiming that that's what ISIS does. Tayeb even attacked the practice of using one's brain, or reason, to understand the Koran, claiming again that this is what ISIS does. When they [reformers] say that Al Azhar must change the religious discourse, change the religious discourse, this too is, I mean, I don't know—a new windmill that just appeared, this "change religious discourse"—what change religious discourse? Al Azhar doesn't change religious discourse—Al Azhar proclaims the true religious discourse, which we learned from our elders. As all Egyptians know, the one man that made the phrase "change religious discourse" famous is President Sisi. He too has publicly called on Al Azhar to reconsider its usage of ancillary books—most notably on New Year's Day, 2015—in an effort to change the international image of Islam, from one of war and enmity, to something more tolerant. 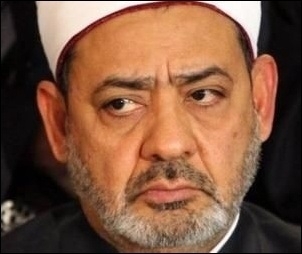 Now the highest Muslim authority in Egypt has made clear that Al Azhar never had any intention of changing anything, that the "religious discourse" articulated in the Medieval era—one of hostility and violence for the other, in a word, jihad—is the only "discourse" Muslims can accept. Anything else is apparently quixotic—"tilting at windmills."